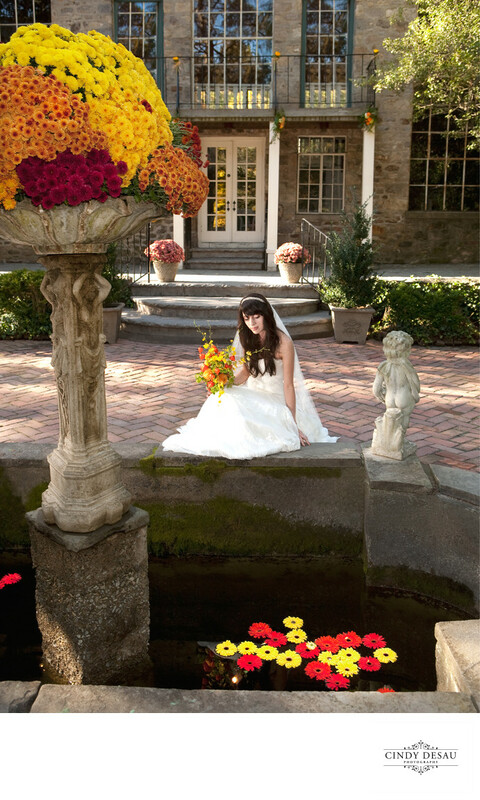 I posed this bride to frame her with the bright colors of the fall mums and daisies floating in the courtyard fountain. This beautiful wedding photograph was created because I wanted to feature this bride in a pictorial way. By having her lean towards the fountain, attention is drawn to the floating flowers, which complement her Boho style wedding attire. The bright hues, although selected for fall color, are also reminiscent of pop culture of the 60's and add to the Boho-chic fashion style. Compositionally, the image is balanced, and also harmonious in color. The blue sky reflecting in the barn balcony window is the complementary color to the yellow orange colors in the fountain, adding to the pleasing harmonious and balanced feel of this image. This wedding photograph was also framed and hung on the wall in the sales office at Holly Hedge Estate, where it was taken. This tells me that it is a favorite wedding photograph of others, as well as myself.